supporting our diverse membership community, you’re not only reaching these individuals, you are showcasing your leadership and commitment to the sleep profession. The AAST Prestige Partner Program aims to provide supporter members with various opportunities throughout the year to share information, insights and innovative approaches with AAST members through the AAST website, A2Zzz, at the AAST Annual Meeting and via direct mailings. A2Zzz is the quarterly online publication read by more than 4,000 sleep technologists. The publication includes editorials, lessons, research and news from the AAST and leaders in the sleep industry. Partners have the opportunity to provide advertising, as well as thought leadership content. 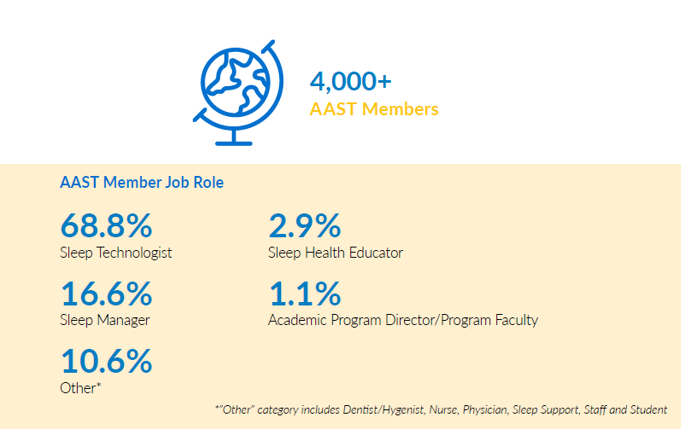 Reach AAST's database of 4,000+ sleep professionals through an email communication or direct mailer. Web banners posted on various pages of the AAST website will give you exposure to over 40,000 monthly visitors. AAST's yearly in-person educational event that brings together 300+ sleep professionals for three days of education and networking. Learn more about becoming an Annual Meeting sponsor or exhibitor. Promote a job opening at your institution to qualified, sleep professionals.